Unit 2 operations supervisor Damon Fegley, right, shows former New Jersey Gov. Christie Whitman the unit 2 control room during a tour of TVA's Watts Bar nuclear plant on Wednesday, April 29, 2015, in Spring City, Tenn.
SPRING CITY, Tenn. — To curb carbon emissions and global temperatures, a former EPA administrator under President George W. Bush said today that adding more reactors like the one TVA is building at its Watts Bar Nuclear Plant here are critical to America's future. Christine Whitman, the former New Jersey governor who headed the U.S. Environmental Protection Agency from 2001 to 2003, said global warming from carbon emissions and other air pollutants from coal power plants are a national security concern and nuclear power can play a role in replacing such generation without harmful emissions. Whitman, who toured the Unit 2 construction at Watts Bar here today, called TVA's work toward finishing the plant "impressive" and said she hopes American utilities will continue to use nuclear power as part of the country's energy mix. Mike Skaggs, a senior vice president at TVA who is heading the completion of Watts Bar Unit 2, said the unit is now 98 percent complete and TVA will begin hot functional testing of plant equipment next month. Pending approval of the Nuclear Regulatory Commission, TVA should load nuclear fuel and start up the reactor by the end of the year. "We feel good about meeting our schedule, but we won't be rushed into any action until we get all of our equipment and processes right," Skaggs said. Whitman said nuclear plants, once built, can still provide power at less operating costs than fossil fuel generation and without the carbon emissions and air pollutants of coal, diesel, biomass or even natural gas. Nuclear power requires utilities to take a longer ecoomic view given the length of time to built new reactors and their multi-billion-dollar expense. "There is too much emhpasis on the short term cost reduction versus the long term savings," Whitman said. Whitman, a co-chair of a pro-nuclear power group known as the Clean and Safe Enegy (CASEnergy) coalition, said nuclear power is gaining appeal around the globe with ambitious building plans for more reactors in China, Russia and other countries. 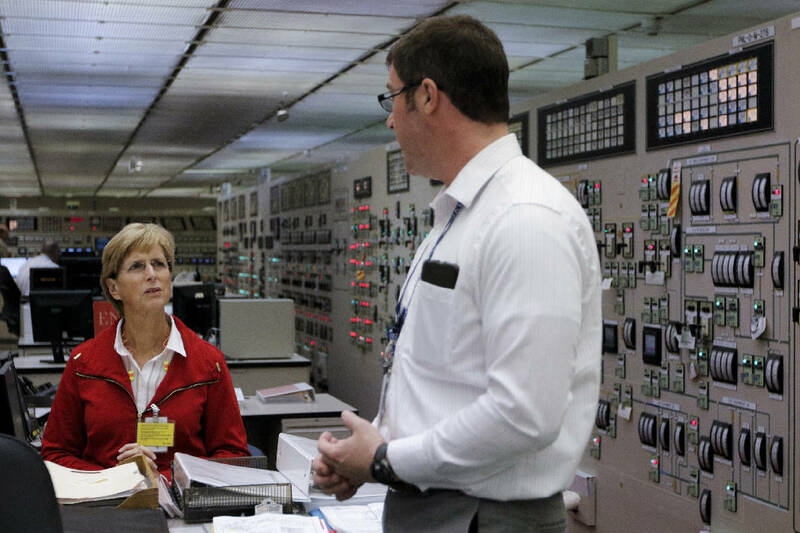 In the U.S., the Watts Bar Unit 2 reactor scheduled to start generating power by the end of 2015 or early 2016 will be the first new nuclear unit added to America's electricity grid in two decades,. Four other next generation reactors are now under construction in Georgia and South Carolina. "You are seeing a lot of nuclear plants being built around the world because people are starting to deal with air quality issues and climate change," Whitman said.